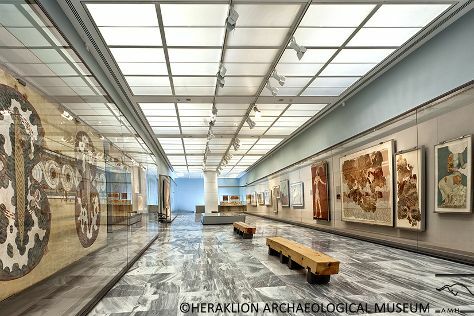 Crete's largest city, Heraklion remains best known for its proximity to a sprawling Bronze Age archaeological site, once the center of a vanished Minoan civilization. Founded by Arab raiders sometime in the 9th century, Heraklion swapped its rulers several times over the centuries, eventually coming under Venetian and then Ottoman control. Before retreating, the successive conquerors left an indelible mark on the city's architecture of medieval fortifications, Byzantine churches, and lavish fountains. The birthplace of El Greco, modern Heraklion is a densely populated city infamous for its traffic congestion. Take a break from the big port city and its throngs of tourists by exploring the ancient sites located just a short drive from the busy coastline. Heraklion is in Heraklion Prefecture. Arrange all the small, but important details of your Heraklion trip itinerary using our Greece trip tool . Heraklion serves as a convenient base for exploring Crete and draws big crowds with its centrally located hotels, which offer free Wi-Fi, secure parking, private swimming pools, and fitness facilities. Although pricey, staying in the city center also keeps you near the area's top shopping, dining, and entertainment. If you don't mind driving to shops and restaurants, explore the mid-range hotels and small inns farther away from the busy coastline, where you can choose a budget-friendly room with sea views and easy access to quiet beaches.